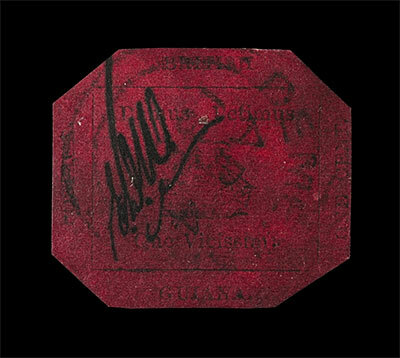 In January 1856, British Guiana issued a small number of one- and four-cent stamps for provisional use while the postmaster waited on a shipment of postage from England. Multiple copies of the four-cent stamp have survived, but the one-cent stamp displayed here is the only one of its kind in the world. It generates headlines and breaks records every time it sells. Every time it has sold, it has generated headlines and broken records. Perhaps we are drawn to its history of wealthy, secretive and sometimes troubled owners. Maybe its origins in the far-flung holdings of the British Empire lends it an irresistible air of romance. On the other hand, the stamp’s mystique may stem from its own elusiveness. It has spent most of its 160-plus years behind bank vault bars, appearing only on rare occasions. This display is the One-Cent Magenta’s longest and most publicly accessible exhibition ever.